Best Travel Coffee Mug Tumbler- Investigator Gifts Ideas for Men and Women. 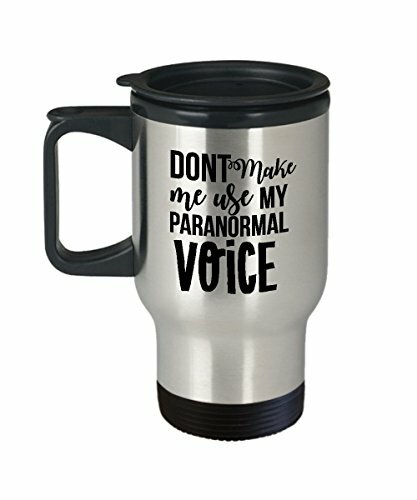 Don’t make me use my paranormal voice. This travel mug is made of stainless steel.It is C-shape handle which is easy to grip. This travel mug is made of high quality material. It can keep your water warm.It's a great mug. HIGH QUALITY: The image is printed with only the highest quality sublimation inks and printing techniques to ensure a lasting print. SPECIFICATIONS: Each mug holds 14 oz worth of liquid and comes with an easy-grip handle and thumb rest. The tapered bottom fits in a standard cup holder. Lid has slide opening and slanted drinking surface. Lid is dishwasher safe and shatter resistant. Since it's made out of stainless steel it is not microwave safe. LIFETIME GUARANTEE: 100% Money Back Guarantee! If you are not completely satisfied with the product for some reason, a full refund will be issued. Your satisfaction is the #1 priority! If you have any questions about this product by Mugart, contact us by completing and submitting the form below. If you are looking for a specif part number, please include it with your message. Best Travel Coffee Mug Tumbler- Investigator Gifts Ideas for Men and Women. Paranormal investigator.